N THE MORNING, when Jesus had left Bethany and was coming towards Jerusalem, He was hungry. Seeing a fig-tree afar off, covered with leaves, He came to it, hoping to find some fruit on it. But the tree was a young one, and had not yet commenced to bear fruit. And He found thereon nothing but leaves. Then He said unto it, "Let no fruit grow on thee henceforward for ever." And the fig-tree withered away and was dead from the roots. When the disciples saw it, they marvelled, saying, "How soon the fig-tree is withered away!" 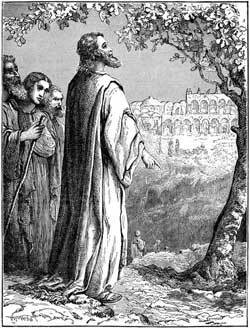 How strange it seems that Jesus, who was gentle and kind, should pronounce a curse on this fig-tree, and cause it to wither away. Why did He do so? Because He wished to impress upon His disciples the terrible danger of unfruitfulness. If we are the disciples of Jesus, we must bear good fruit; we must be loving, kind, and gentle, and try, like Him, to be always doing good.